Oncotarget is indexed/archived on PubMed and PMC. 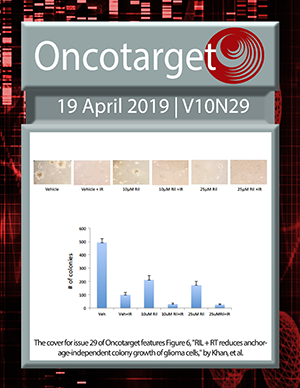 All volumes (1-9) of Oncotarget are available on PubMed. Volume 10 (2019) issues (1-20) are now on PubMed. "This journal continues to play a major role in the publication of important basic science research papers. Editorial practices are consistently high. Ethical guidelines are consistently followed. This is an important research journal for the field." Scopus/SJR ranking: 2011-ongoing: Q1 (highest rank). All years Q1 in Medicine and Oncology (subject area).